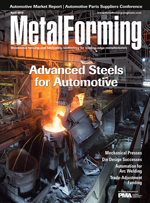 Development and commercialization proceeds on third-generation advanced high-strength steels, and in other areas, as automakers continue safety, lightweighting and efficiency efforts. Together with FABTECH Mexico and AWS Weldmex, this event represents the primary gathering for metal-related manufacturers in Mexico. ...for this Wisconsin supplier of primarily medical-industry stamped parts and assemblies. On tap: transformation, vertical integration and scaling-up operations, catalyzed by an aggressive capex program including new mechanical and servo presses. Sales slow while myriad transformative technologies reshape the industry.